Top 5 malayalam movies of 2013 box office for Quarter 1 is added here. The selection is made on the theatre performances during the first 3 months. Among the 47 malayalam movies released in January – March, five movies have got into the top 5 list. Amen , Shutter , Celluloid , Annayum Rasoolum and Emmanuel. Considered the number of releases and upcoming movies, 2013 can be proudly said to be the golden year of malayalam movie industry. With around 200 plus malayalam movies predicted to get released only in 2013, it would also be best opportunity for young talents to give their performance. Among the 47 malayalam movies released between January – March, we have selected five movies to fit into the top 5 list chart. The movies are Amen, Shutter, Celluloid, Annayum Rasoolum and Emmanuel. The selection is made on the box office performance and critic's reviews. Amen is one of the most exciting malayalam movie released in 2013 which can be considered as a romantic musical satire directed by Lijo Jose Pellissery. Themed around the lives of few people around an ancient Syrian Church, the movie features Indrajith, Fahadh Faasil, Swati Reddy, Natasha Sahgal and Rachana Narayanankutty in lead roles. It also marked the debut of Telugu actress Swati Reddy into malayalam. Set under the backdrops of a parish in Kuttanadu during the 80's, the movie which is completely based on Christian background does give importance to church, church choir, and the festivals of the church. Solomon (Fazil), a verger in the Church falls in love with Sosanna(Swati Reddy), who is the only daughter of a rich contractor, Philippose(Nandu). Their love gets into the roots as Sosanna stays as a singer in the church choir. For being members of two different classes in the society, their affair does not get accepted. On the other side Father Vincent Vattolli(Indrajith) is in love with Michelle(Natasha Sahgal). The rest of the story travels through unexpected incidents which takes the movie to the next phase. Released on 22nd March 2013, the movie received positive reviews from critics along with huge response from theatres. Most of the movie critics praised the director Lijo Jose Palliserry for his skill behind the camera while the cinematography of Abinandhan Ramanujam too got applause. The movie was overall praised for it's visually and technical brilliant. According to box office report the movie which has spend around 4.25 Crores as production cost has made around 3.69 Crores in 10 days. The final verdict of its business will depend upon the new releases. Shutter is a malayalam thriller movie which is the directorial debut of Joy Mathew, a known theatre actor and dramatist. Focussing of the life of the Indian labourers living in the Gulf, the movie is set on the backdrops of city of Kozhikode. The movie features Lal, Sreenivasan, Vinay Forrt , Sajitha Madathil, Riya Saira, Nisha Joseph, Augustine, Prem Kumar, Vijayan Karanthoor and Appunni Sasi donning prominent roles. Rasheed (Lal) a Malayali non-resident Indian working in the Gulf comes to his hometown Kozhikode to attend the engagement of his daughter. Rasheed has spent money for a commercial property which was given to store owners, except for one room. He wanted to use this room for business purpose after he makes final return from Gulf. Rasheed and his friends enjoyed the time in the room with drinks every night. Manoharan (Sreenivasan) was one of his friend who is a filmmaker wandering in search of a producer. During one of the drunken night, Rashid gets locked in his garage along with a prostitute. Nanmarayil Suran (Vinay Forrt), an auto rickshaw driver and one of his friend locks the garage from the outside which made the two stay together. The couple had to spend two nights and a whole day caged. Rest of the story makes the movie interesting. 'Shutter' is a moral suspense thriller which got screened at the 17th International Film Festival of Kerala and international premiere at the 9th Dubai International Film Festival. The movie won the Silver Crow Pheasant Award for Best Feature Film (Audience Prize) at the 17th International Film Festival of Kerala. Released on 22nd February in 42 theatres in Kerala, Shutter received rave reviews and positive reports from theatres. Celluloid malayalam movie written and directed by Kamal is a biopic based on the life story of J.C. Daniel who is regarded as the father of Malayalam cinema. Based on the novel titled 'Nashta Naayika' written by Vinu Abraham and Life of J.C Daniel written by Chelangatt Gopalakrishnan, Celluloid focus on the detailed life of Daniel who made the first movie Vigathkumaran and portraits the tragic story of P.K Rosie, the heroine of Vigathakumaran. The movie features Prithviraj, Mamta Mohandas, Chandni, Sreenivasan, Sreejith Ravi, T. G. Ravi Nedumudi Venu, Sruthi Dilip, Siddique, Irshad, Thampi Antony, Ramesh Pisharody, Nandu Madhav, Thalaivasal Vijay, Jayaraj Warrier and Chembil Asokan. Celluloid tells the tale of J. C. Daniel (Prithviraj) and his love and passion for cinema. To make his dream come true, Daniel travels through various phases. After months of search Rosamma, who was later rechristened as Rosie (Chandini), essayed the lead role in J. C. Daniel's Vigathakumaran. He sells everything and also borrowed money to meet the expenses. When Vigathakumaran was screened at Capitol Theatre, the members of the upper cast uproar against a lower cast girl acting as a Nair lady. Rosie had to leave the town. Years later, Daniel and his wife Janet (Mamta Mohandas) lead a pathetic life. Chelangatt Gopalakrishnan's (Sreenivasan) who was interested in Daniel's life, take some effort to shed light into Daniel's life after his experience with Vigathakumaran which form the rest of the movie. The film had an earth shattering opening with tremendous response and strong positive reviews from the spectators. It bagged seven Kerala State Film Awards including for Best Film and Best Actor (Prithviraj). Annayum Rasoolum, a romantic film written and directed by Rajeev Ravi, G. Sethunath and Santhosh Echikkanam was directed by Rajeev Ravi. Produced by D-Cutz Film Company in association with E-4 entertainment, the movie revolves around the rapport between a young Muslim taxi driver and a Latin Christian girl. The movie features Fahadh Faasil, Andrea Jeremiah, Sunny Wayne, Soubin Shahir, Shine Tom Chacko, Srinda Ashab, Aashiq Abu, Sija Rose, P. Balachandran, Ranjith, M. G. Sasi, Joy Mathew and Rajesh Sharma. The movie opens with the narration of Ashley (Sunny Wayne) who works in merchant navy. Rasool (Fahadh Faasil) is a tourist taxi driver from Kochi who falls in love with Anna (Andrea Jeremiah), a Latin Christian girl who works as sales girl. To convince Anna about his love, Rasool follows her on the ways and on the boat on which she traveled regularly. One day Rasool approaches Anna and opens his mind. Surprised by the words, Ann goes away without giving an answer. After some melodious drama Rasool tells Anna that religion does not affect his affection towards her. Incidents which happen in the life of Anna & Rasool takes the movie to to the next extend. 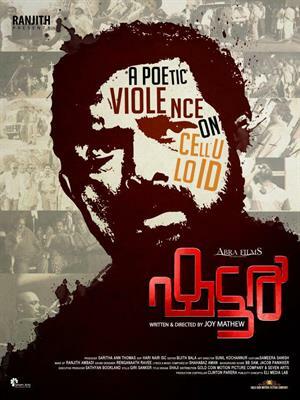 The movie received well reception at the box office with critics praising the directorial debut of Rajeev Ravi. The clever use of the cinematography and the realistic way of conveing a love story played a key role in the success of movie bagging gthe first malayalam hit of 2013. Immanuel is a Malayalam film directed by Lal Jose which stars Mammootty in lead role. Produced by S.George the movie features Fahadh Faasil, Reenu Mathews, Sukumari, Salim Kumar, Guinness Pakru, Sunil Sukhada, Ramesh Pisharody, P. Balachandran, Bijukuttan, Devi Ajith, Balachandran Chullikkadu, Mukesh, Devan, Muktha and Anil Murali. The movie tells the tale of Immanuel who works in a book publishing firm. As the company got closed down due to some unexpected reasons, Immanuel find it difficult to pull on his life forward. The rest of the story goes through the hardships faced by which makes his to take work outside his comfort zone. Immanuel got well reception from the movie lovers and also the critics gave positive remarks. The movie which was released on 5th April is running successfully in the release theatres able to sustain its ride even in second week. So among the 50 plus malayalam movies released in 2013, the above 5 wold be the best to watch while a few others too had entertained the audience.